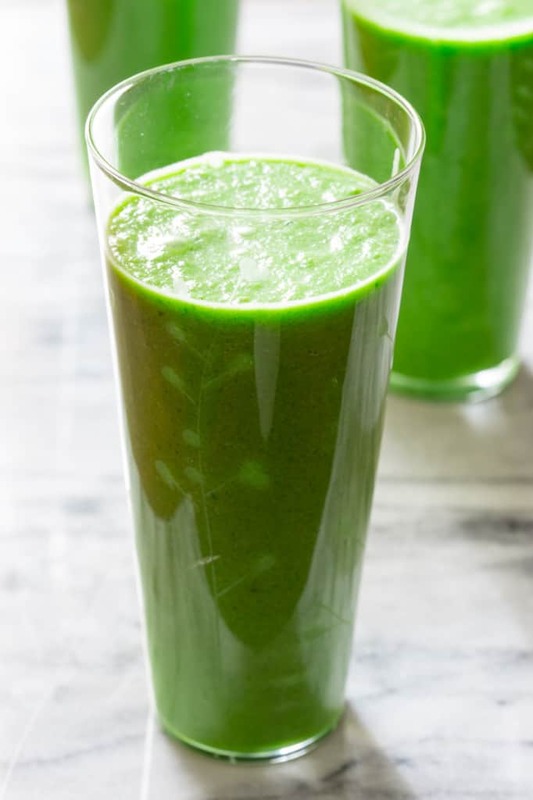 A simple green apple smoothie with kale and coconut milk. It is a healthy vegan way to start your day or snack. Glance around my living room—don’t mind the bins of Legos and wooden train tracks—and you may notice a tall stack of cookbooks on my coffee table. In our house, we don’t have any typical big glossy coffee table books about dogs and landscape photography. Instead, you’ll find Sweet Paul’s Eat & Make, Andy Ricker’s Pok Pok and Plenty by Yotam Ottolenghi. In the evening, when I am not absorbed in an episode of Outlander or Pinteresting away, you’ll maybe find me ensconced in a copy of another beautiful cookbook, glass of red wine, sighing and delighting in the inspirational recipes and photographs. 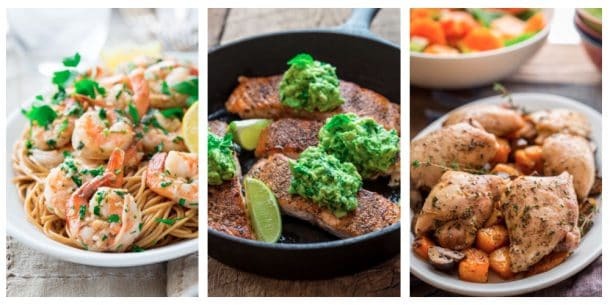 I think of cookbooks like going out to a good restaurant: they fuel and inspire my creativity in the kitchen. Unlike a restaurant though, cookbooks also inspire my photography. I love that each one has its own unique touch and feel. They are irresistible. But I rarely cook from cookbooks. The vast majority of the time the reason I don’t cook from cookbooks is that I am usually making up and working on recipes of my own. When I am not officially recipe developing, I am more of a ‘what do I have in the fridge that needs to be used up’ kind of cook than a ‘plan it out on Sunday and follow along all week long’ cook. At dinnertime, a lot of time, I will pull ingredients out of the fridge and actually start cooking before I decide what we are having. Even still, that doesn’t stop me from collecting cookbooks and reading them as if they were some sort of deeply engrossing mystery novel. 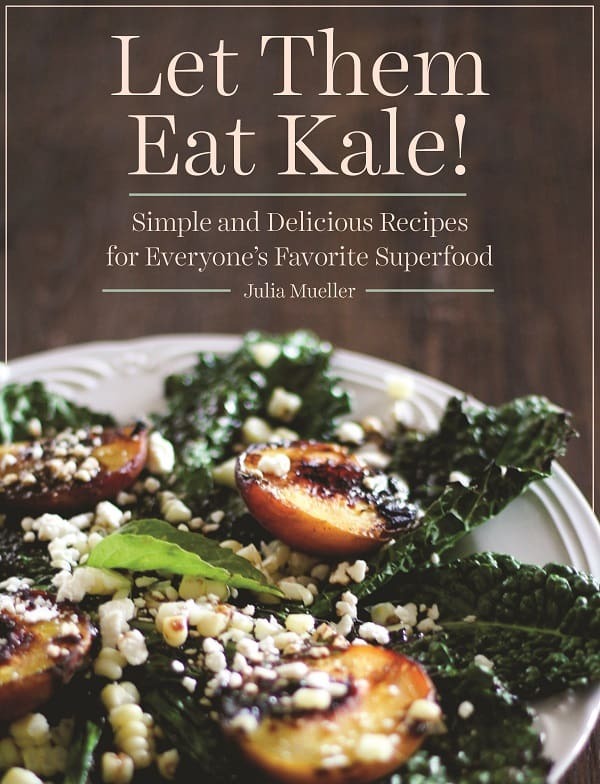 When Julia Mueller sent me a copy of her new cookbook, Let Them Eat Kale, I was so excited to look through it, gaze at the beautiful photographs, read her introduction about the health benefits of kale and smile at the carefully crafted headnotes. 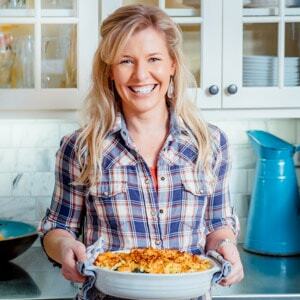 I love the flavor combinations she has come up with, and the unexpected ways she has incorporated kale into all 75 recipes. I sent her an email and told her I wanted to do a little review here on the blog, and that I would happily run a recipe from the book. So it was with a sudden overwhelming excitement that I realized that I would actually be cooking a real live recipe from a cookbook. There were so many that sounded so good with ingredients that are in season right now. The recipe on the cover actually is of a salad that would be smashing right now while you can get fresh peaches and sweet corn. I also can’t really stop thinking about the Spaghetti Squash with Spicy Mushroom, Roasted Garlic and Kale Sauce. Inspired I am! 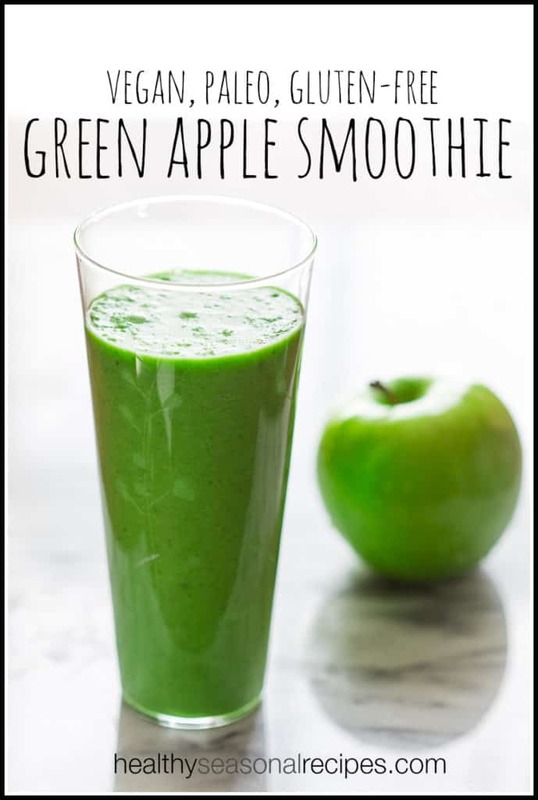 But it was a simple green apple smoothie that really caught my eye. Maybe because this recipe seems like the perfect bridge between summer and fall. It is cold and refreshing for the last few hot days of August, though the apple and ginger flavors alludes to the tastes of autumn to come. This seasonal transition is kind of coming all at once. If the big numbers of people flocking to my BodyPump classes is any indication, I think it is not just me either. My kids went back to school yesterday, and I think a lot of us are ready to get back into the swing of things, getting to bed a littler earlier, eating clean and exercising as we head into fall. My thinking was that this vegan-friendly and paleo smoothie recipe would help us all bridge that gap smoothly. I also have to admit that I don’t think I would have the guts to try this combo without a recipe assuring me that it was any good. I was worried it would be too gingery or too sour or that my blender wouldn’t make it smooth enough. So I was so surprised and delighted that this green apple smoothie was lovely. Just the right level of sweetness (not too tart, but not cloyingly sweet either) and the coconut milk really cuts the ginger so that it doesn’t knock your socks off. I loved the texture, though Julia does say that adding a frozen banana to it will make it creamier if you find it too gritty. I used the honey option, but if you are vegan feel free to use maple syrup or agave and adjust the level of sweetness to suit your palate. Do you read cookbooks like novels? What kind of books do you keep on your coffee table? Are you transitioning into fall or holding on to summer for dear life? What do you put in your green smoothies? 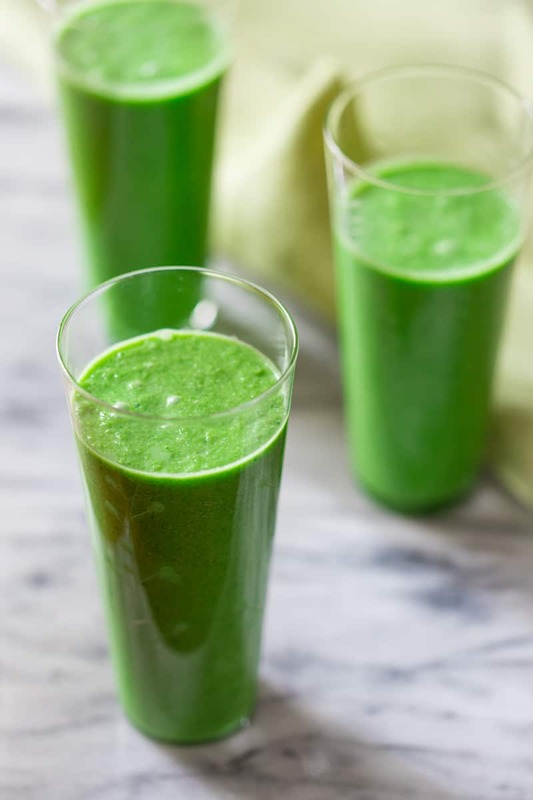 A creamy green apple smoothie that’s packed with kale and ginger. It’s naturally gluten-free and is a healthy way to start your day! 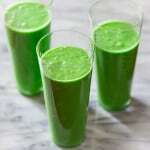 Combine apple, kale, ginger, honey or sweetener, coconut milk and almond milk in a blender and puree until smooth. I have the Pok Pok cookbook on my coffee table too! And yes, I read it like a novel! I have been in a rut with my smoothies lately, my standby is blueberries, pear, chia seed, spinach, coconut milk. I definitely want to try this green apple smoothie. I love the sound of your standby! Yum! Yes, give this one a try it is surprising and delicious. It’s funny, I have so many cookbooks and continue to buy more, yet I rarely cook from them. Or at least not as much as I’d like to. I love Julia’s book and this smoothie is the perfect summer to fall transition. I am glad I am not the only one Kelli. Ha ha. Isn’t her book beautiful. Such an inspiration. So glad to feature your cookbook Julia. It is a great accomplishment and a job well done. Love this smoothie and I will be making it again soon. Apple is such a lovely fruit for a smoothie and I love the ginger with it. Do you use Coconut milk in the can or like the Silk kind? I used canned.Hope you enjoy! Would this work with spinach instead of kale? Yes! Totally. And the texture will probably be a little smoother.